WGR550 - celebrating a Bills win! Partagas' Legend line is a three cigar assortment launched at the 2018 IPCPR. The Legend line is an homage to the founding fathers of Partagas - Ramon Cifuentes, Benji Menendez, Edgar Cullman Sr. and, of course, Jaime Partagas. Jhonys Diaz, the cigar's blender and General Cigar's master blender, studied under each of the men. Supposedly, each of the locations where the tobacco is grown and the leaf varietals themselves hold a special meaning and carry historical significance to the brand's founders. All tobacco used in the blend is significantly aged however the length of aging is unknown / undisclosed. The original Partagas brand dates back to Jaime Partagas' founding around 1845 in Havana, Cuba. This cigar is produced by the non-Cuban split off of the marca. After Partagas' sudden death, his son Jose Partagas ran the show prior to selling Jose Bances. It was Bances that brought in Cifuentes as a partner - whose son, Ramon Cifuentes Toriello, continued the legacy of his father. 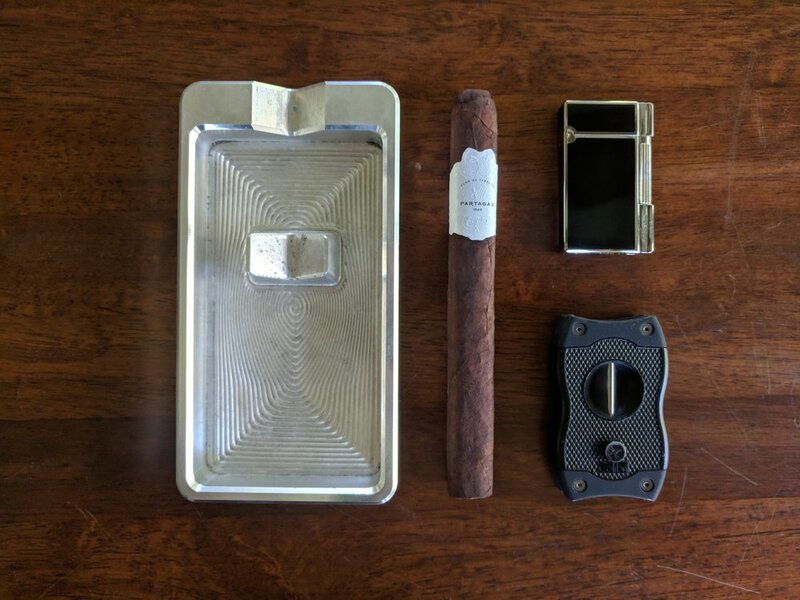 Following the Cuban Revolution, Cifuentes Toriello lost his brand to the government and declined an offer to lead a state run tobacco business. He subsequently left for the US and founded General Cigar - which holds many familiar traditional Cuban marcas' nomenclature and branding. The all white band and box are a drastic shift from Partagas' traditionally dark/black theme. 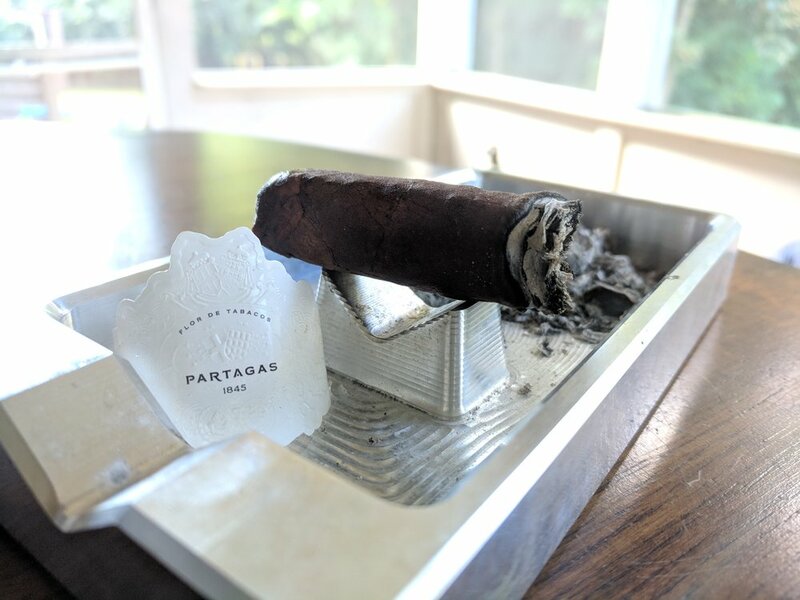 According to Partagas, it is a purposeful direction and meant to represent a forward-looking mindset. The boxes are certainly beautiful - each one is white-lacquered and holds 20 cigars - complete with a story of the cigar's genesis on the lid. 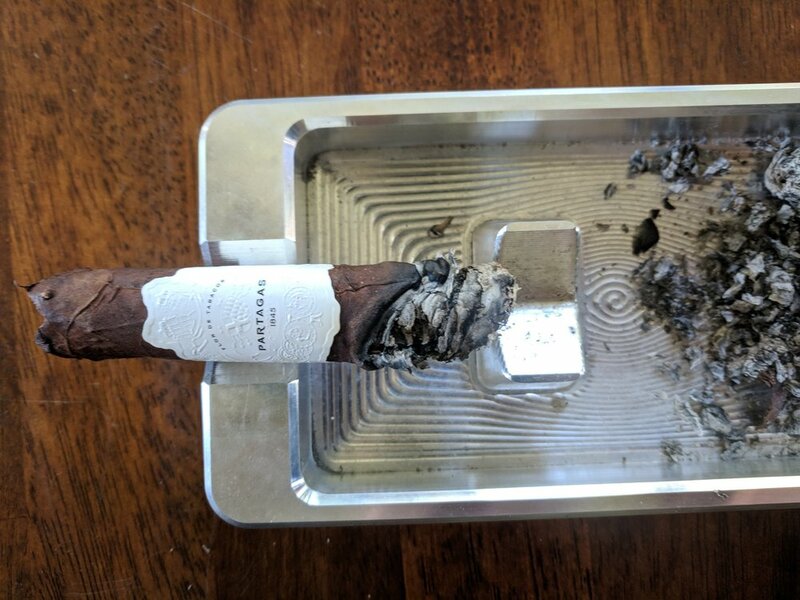 The band itself is completely white and contrasts fantastically with the dark Connecticut broadleaf wrapper. It is complimented by understated black text simply stating the marca and embossed to create some elegant details. 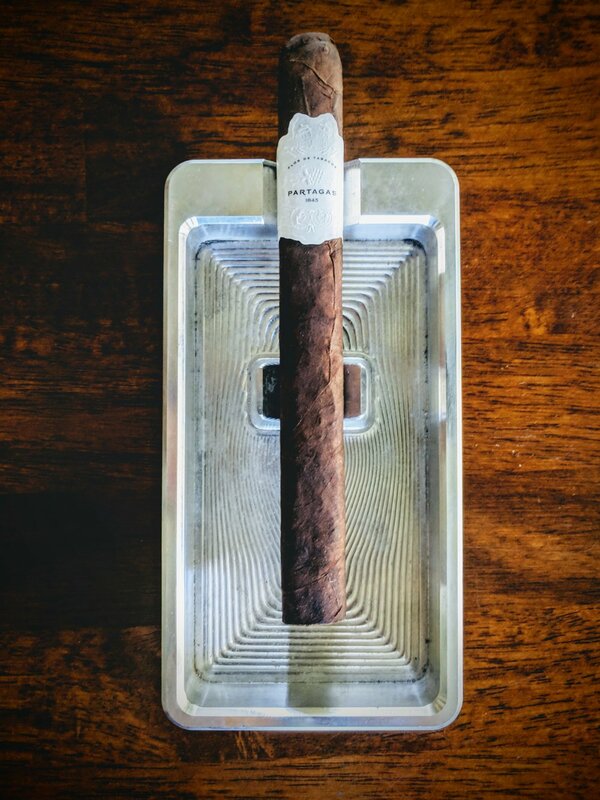 This feels like a well thought out, uniquely branded cigar - meant to simply but gracefully convey the cigar's intention. 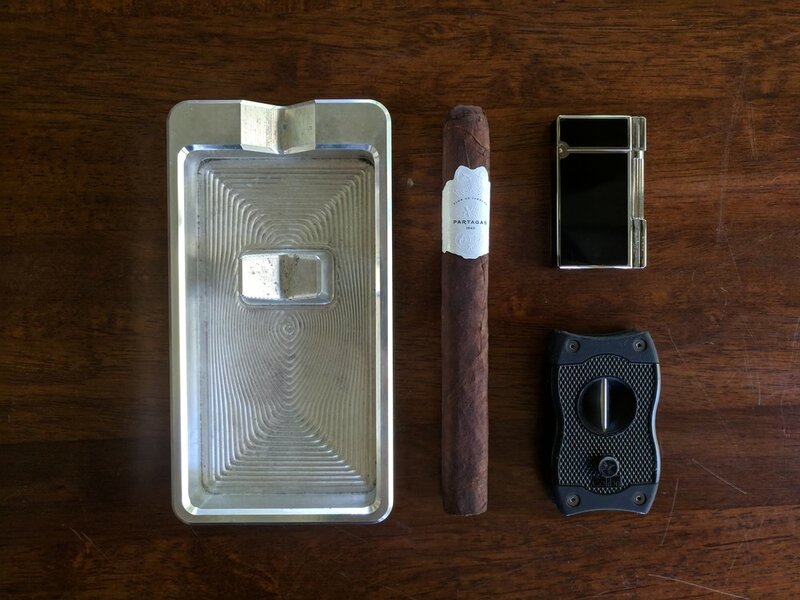 .A soft inspection of the cigar yields a couple hard spots on an overall slightly softer cigar. As mentioned above, the cap is sloppier than the rest of the cigar appears. While rustic, the body is well rolled but the cap looks like a bad toupee - with areas not completely glued down and weird clumps. The foot on the other hand is gorgeous. The blend looks like it has some great color variation to it and is evenly rolled - not too open or dense. The foot brings out some light cedar and stone cellar notes but the prevailing aroma is cocoa/chocolate. It smells amazing and certainly sets a great stage prior to lighting up. A nice deep v-cut reveals a perfect draw - if not slightly too open. The cold draw brings out a nice blend of flavors all toward the sweeter side - the closest I can come up with it s'mores without the Hershey bar. Some toasty sweetness with a bit a the grain/honey graham crackers present. The Partagas Legend Fabuloso lights up perfectly. The draw is open, although could offer more resistance and the foot lights evenly and effortlessly with voluminous amounts of aromatic white smoke. There is very little harshness on the first few puffs, with flavors leaning again toward the sweeter side with maybe just a hint of soft pepper lingering on the finish. Initial retrohale really enhances the experience. A nice smooth retrohale yields very nice notes of leather, cocoa and some earthiness. The smoke output is great while puffing - nice clouds of pleasant smelling white smoke. While resting there is very little to no smoke. There is a tannin-like dryness to the Legend - very reminiscent of a dry red wine. 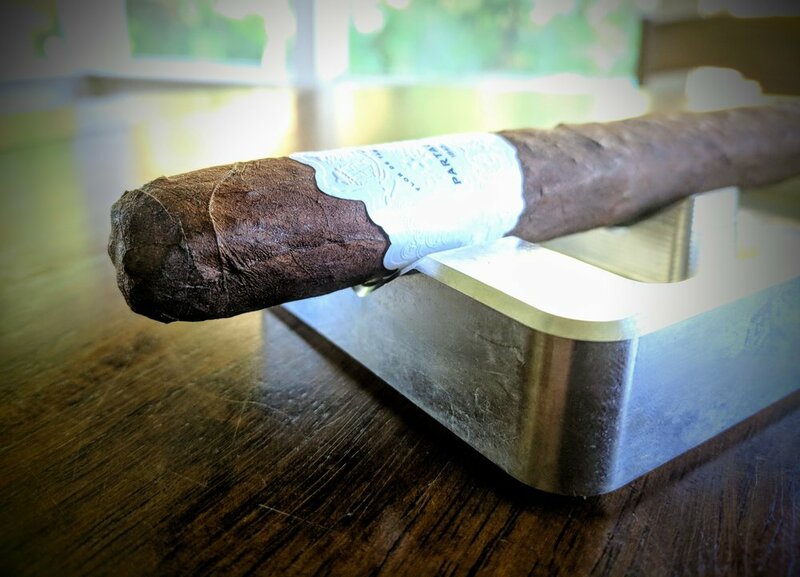 The initial flavors produce a subtle fruity sweetness that wets the tongue and then as the smoke leaves your mouth it offers a moment where it's replaced by a definite dryness - almost like eating a little cocoa powder. The main flavors I'm getting are all tangled up and not necessarily easy to discern from one another but here's my best guess: cocoa with a little bit of earth and sweetness. The draw has not changed - remaining open and easy to smoke. Some people would probably prefer a tighter draw but as long as it's not producing to hot of a burn or bringing too much heat to the mouth, I'm generally ok with it. While far from perfect, the burn line is working to correct itself through the first third. So far, nothing worthy of a touch up. 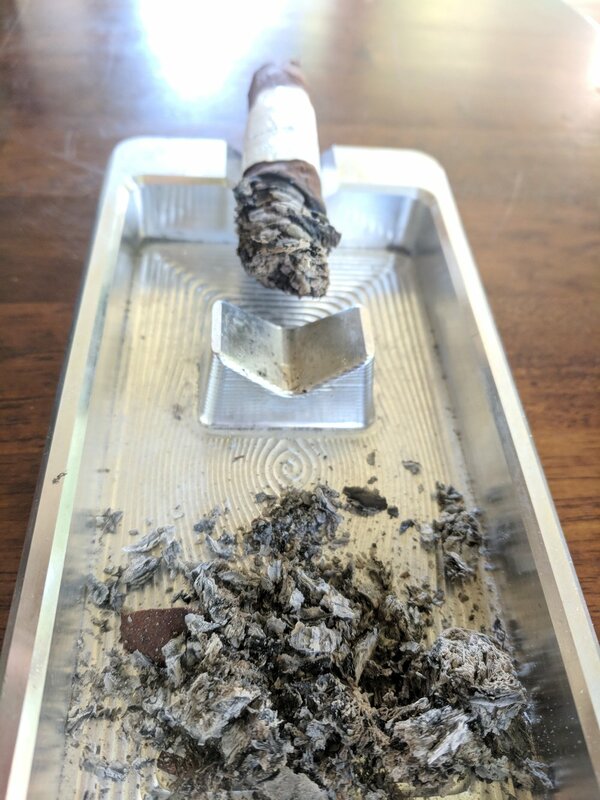 The ash from the first light up dropped off almost immediately - about 1/2-inch into the cigar. After that, it's managed to hang on firmly. It has a light tan color mixed into primarily grey with black strands present every so often. The second third flavor's are starting to develop slowly. Whereas some cigars are a blast of flavors but this one seems intent on not doing too much too fast. At some indistinguishable point, the sweetness begins to fade and be traded out for some subtle earth based tones - good amount of leather, earth and a bit of spice notes. Much like the first third, the draw is quite open - no hot harshness but I'm getting nervous for the final third.The burn line is still not even close to razor sharp but it's passable. There's plenty of deviations but so far it's still working on correcting itself slowly but surely. The ash has been holding fairly steady and dropping about an inch at a time. It seems pretty flaky - even the solid chunks are porous and loose. For the last act, the flavors continue to meld into a sweeter, rich, creaminess. While soft and nice yet still robust, it isn't complimented by the draw at this point. The open draw is bringing a little extra heat to the tongue and it hinders the flavor profile significantly. Even casually puffing and attempting to ease off, the heat is counter productive. Retrohaling produces a better flavor profile and inserts a little black pepper into mix. Partagas' Legend Fabuloso is a pleasantly blended cigar - never too overbearing and very nicely balanced. While the flavors are hard to define and far from pronounced, they softly make their presence known and leave impressions of flavor rather than bombing your palate. Unfortunately the final third was marred by the open draw, you can tell the flavors would have progressed well to the a great culmination. The burn was acceptable to a point - never sharp but never warranting a touch up or relight. The real downfall came at the hands of the draw and its openness becoming debilitating bad for the final few inches. Nuance truly is the best word to describe Partagas' Legend Fabuloso. The flavors are subtle but present as well as perfectly balanced. Earth and cocoa really make up the bulk of the experience - an experience that was only marred by an open draw on the final chunk. While the flavors of the blend showcase the hand of a master blender, the quality of the roll is that of a novice roller. The flavors are perfect but the construction leaves much to be desired. The burn line was never reliable and the final third became unsmokeable as the loose draw ruined the flavor profile. The aged tobacco used for this blend is meant to shine and does for a bit but is ultimately betrayed by shoddy construction. It’s a small sample size but looks like I may have been a little overly critical on Partagas’ new flagship stogie. 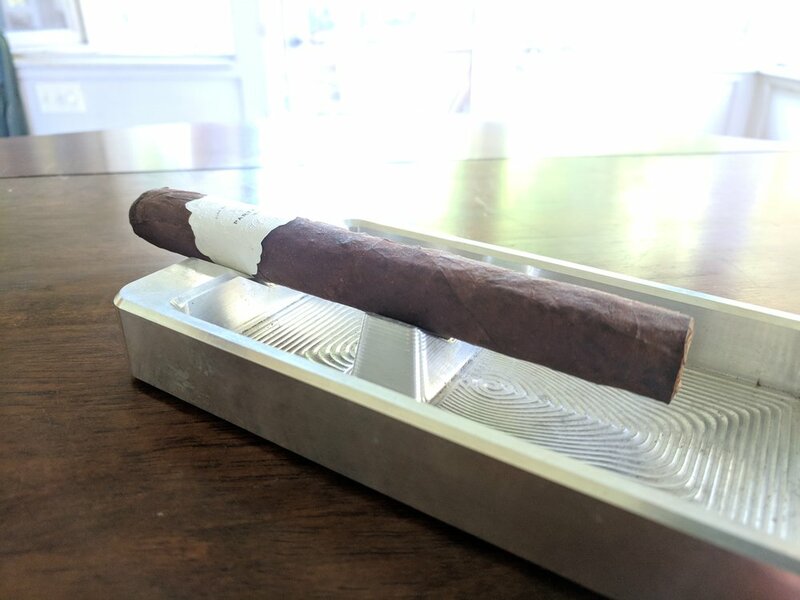 It’s a cigar I definitely won’t mind revisiting to see if some of the burn issues are still there and if maybe time will do the flavor profile some favors.